As a fan of the Marvel Cinematic Universe franchise, I stumbled upon the Romanian actor Sebastian Stan. He portrays the role of Bucky Barnes (which also means the Winter Soldier and the White Wolf), and whilst this is a supporting instead of a main character, Sebastian Stan turns out to have a massive (online) fandom behind him. In 2017, BuzzfeedNews asked fans why they love Sebastian Stan so much, to which one of the fans replied: ‘As I saw more interviews with Sebastian Stan he seemed like someone I could relate to in how he can be awkward and funny! You can tell he really loves and appreciates his fans and I think that is really important’ (BuzzfeedNews, 2017). By doing my own research and asking fan accounts some questions, I discovered that the Instagram fan accounts about Sebastian Stan have many ‘close’ connections online: fan accounts contact and get to know each other on a daily basis (through individual contact as well as in group chats). The fandom genuinely cares about other Sebastian Stan fans, and the fan accounts would love to meet each other offline one day. In other words: online connections are being built and maintained every day, and ‘strangers’ are becoming friends. Sebastian Stan has played many beloved characters over the years such as: Carter Baizen in ‘Gossip Girl’, Jefferson in ‘Once Upon A Time’, and Jeff Gillooly in ‘I, Tonya’. But ever since his first appearance as Bucky Barnes in the Marvel movie ‘Captain America: The First Avenger’, he has been best known for portraying this role. The Marvel Cinematic Universe is an American media franchise that produces series of superhero films. These films are based on American comic books published by Marvel Comics. In 2008, the first film, titled ‘Iron Man’, was released, and in the last ten years nineteen more movies have been made (Wikipedia, 2018). Sebastian Stan has played in six Marvel movies so far - in two of which he only appeared in end scenes - and since he has a nine picture movie deal with the MCU (Marvel Cinematic Universe), there is a high chance that we will see him again in upcoming Marvel projects. When I started following Sebastian Stan on the social media platform Instagram, I instantly got a lot of fan accounts recommended and received all kinds of fandom posts on my explore page. Since fan accounts are public and accessible for everyone to see, follow, react to, like, etcetera, many connections are visible. Because of social media, fans are able to easily meet other fans (of their fan base), and new connections are being made online (and sometimes offline). I noticed that most fan accounts communicate with one another, for example by showing each other their support, giving shout outs, liking each other's posts, following other fan accounts, commenting on posts and much more. The screenshots below show examples of interaction between fan accounts. The owners meet offline to watch the newest Sebastian Stan movies together, and fan accounts comment on and like each other'﻿s posts. I was, and still am, intrigued by how big his online fandom is, and for this article I decided to contact multiple Sebastian Stan Instagram fan accounts and ask them questions about the connections they have built online. However, before we go into the results of my research, it's important to highlight how globalization and digitalization have changed fandoms. Fandoms have always existed, but because of social media platforms the fans are now able to connect in an easier and faster way. Globalization is happening online. All kinds of connections are being created between people who do not know each other and who, without social media, probably would never have known each other. ‘The first is immediacy, meaning that fans from all over the world can instantly post messages that can be accessed, read, and responded to within a moment’s time’ (Liberman, Plugh, and Geltzeiler, 2015, p.66). Because of this, the feeling of sharing a social space and being an interactant increases. It also shows accessibility - anyone can easily participate. The second change is about response, which we seek for three reasons: hope for change, feeling of social solidarity, and emotional liberation. Fan accounts for example, hope that their idol reacts to or sees their posts, and that other fans agree with or like their opinions. Since social media show us testimonial proof of likes, reactions, shares etcetera, we can actually count and see the support and social solidarity. Since social media show us testimonial proof of likes, reactions, shares etcetera, we can actually count and see the support and social solidarity. The third change has allowed fans to socially construct a sense of community, ‘creating social capital’. By having similar interests, the fans feel a connection with each other, and from a psychological perspective, this might be enough to construct a sense of shared community (Liberman, Plugh, and Geltzeiler, 2015, p.66-68). Largent and Burnett (2015) talk about fans as journalists. You could say that fan accounts have an identity that contains journalistic characteristics: they give online updates about their idol, sharing where s/he is, what s/he is doing, where s/he will appear, etcetera. The pictures below are examples of such journalistic traits. The fan accounts mention future appearances, such as Sebastian Stan being a guest on Jimmy Kimmel Live. 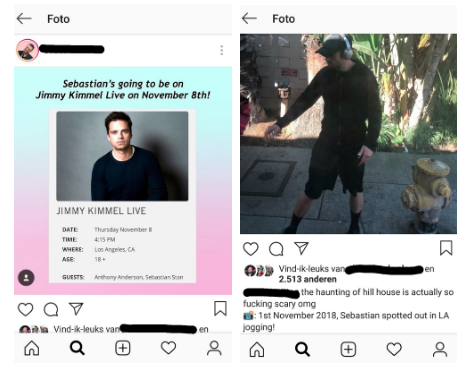 They talk about his daily activities: ‘1st November 2018, Sebastian spotted out in LA jogging!’ and they update their followers about projects that will feature Sebastian Stan, for example an upcoming series about him and a fellow Marvel actor, or sharing the premiere date of his newest movie. In sum: on the Web, passivity has been replaced by (inter)activity. Online globalization creates fandoms where people from all over the world are connecting with one another. Responses, reactions, and connections are faster, easier and more widespread. Besides sharing information about their ‘idol’, fans create a shared community on the web. As previously mentioned, online globalization has changed the nature of fan accounts. Social media allows people, fans, to get to know each other, no matter where they are from. 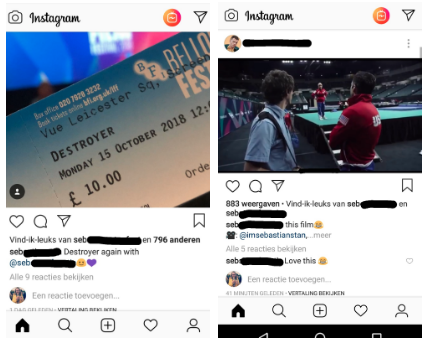 To gain insight into fan accounts and their connections, I contacted Instagram fan accounts about the actor Sebastian Stan. Over the span of a couple weeks, I contacted 35 different fan accounts of which 12 fan accounts answered my questions. The number of followers are different: the smaller fan accounts have around 5000 followers, the bigger ones between 100,000 and200,000 followers. Most owners are private, but every now and then their age, name and/or gender is mentioned in their Instagram bio, story or posts. Based on that information, you could say that the owners are between the ages of 18 and 25 years old, and that most - almost all - are female. Their background or residence is mostly anonymous. The answers I received taught me a lot of new things about the online fandom. I categorized them in the following topics: the reasons for starting a fan account, the connections between fan accounts, and lastly: the contact with followers and the surprising results of starting a fan account. Before I asked the fan accounts about their reasons, I was curious about how long they considered themselves to be part of the fandom. How long do you have to be a fan before starting a fan account? The answers were diverse: most people have been a fan for years, others for about one year, some for a couple of months, and a few started an account when they were just getting into the fandom. What I noticed is that everyone already considered themselves to be (actively) part of the fandom before they started a fan account. For some, that feeling came from following fan accounts with their personal account in the first place, for others the feeling was already always there. What I noticed, is that everyone already considered themselves to be (actively) part of the fandom before they started a fan account. The biggest drive to start a fan account is the love for and the interest in the actor. Many fan account owners saw the work of Sebastian Stan, appreciated him and his work, and wanted to create an account where they could show their love and support for the actor. For these fans, Sebastian Stan is not only an actor, but also a role model and inspiration. Another reason for starting a fan account is to meet other people in the fandom, to share their love with people who also "﻿stan"﻿ Sebastian. (To stan someone means to be an obsessive fan of a particular celebrity, this is not to be confused with the actors last name.) Some of the owners had fan accounts prior to the one for Sebastian, and wanted to start one for him just to (more actively) be a part of the fandom. Another motive has to do with the edits that these fan accounts make. Fans make photo edits, write fan fiction, create threads, create memes,etcetera about the actor. Not wanting to annoy friends, family, and/or followers on their personal accounts, these owners decided to create a fan account. Several fans talk about how their friends or family do not really get their obsession, or are not as obsessed as the fan is. Some owners, being such a ‘stan’ of Sebastian Stan, got encouraged by friends to start a fan account. Based on my findings, it is safe to say that if you would start a fan account about Sebastian Stan, building connections with other fan accounts is guaranteed. Not a single fan account told me that s/he did not have any connections. Many talked about how social media, for Instagram in particular sending a DM (direct message), makes it really easy to contact and meet (new) people. The fan account owners feel ‘very connected’, have made many (internet) friends, and feel close to other fan accounts. They describe each other as ‘sweet’, ‘kind’, ‘amazing’, and talk about feeling blessed and grateful to have met other fans. 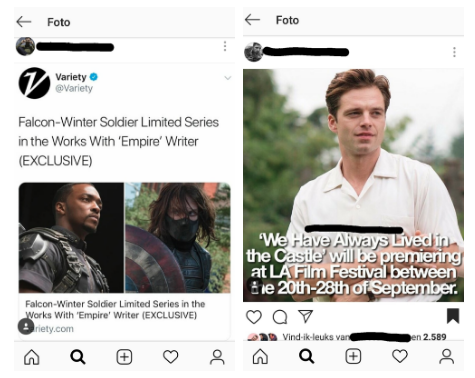 Besides having contact with other fan accounts that are about Sebastian Stan as well, there are also many connections with fan accounts about Marvel (actors). The Sebastian fandom has a lot of contact with the Marvel fandom. Apart from individual contact, there are also group chats. These groups are either very active (for example when there is drama in the fandom or when the group has just been created), or the group is inactive and has kind of ‘died’. Most fan account owners are part of multiple groups (about two or three), but most of those groups are inactive. Some groups also exist on Twitter. Whatsapp seems to be a platform that does not get used, possibly because it would reveal a lot of personal information, which is interesting because some fan accounts do seem to know the others personally, but more about that below. Most groups are not exclusively about Sebastian Stan, but also talk about Marvel (actors). Most fan accounts are positive about groups, they are a great way to meet new people and it is fun to share the passion for Sebastian Stan. But, it is a reoccurring thing that most groups are only active at the beginning. The most recent group that multiple owners talk about is the ‘wecare4seb’ group where they all helped with running an account for Sebastian Stan, which the actor himself actually ended up following. The contact between fan accounts is mostly online, although many owners told me that they would absolutely love to meet the others in person one day. Some fans have met at Comic Cons. Many fan accounts try to go to as many Comic Cons as possible and sometimes meet each other there. Comic Cons are conventions that are all about comic book culture, and fans are able to meet creators, actors, and experts of comic book culture. Since the Marvel movies and series are based on comic books, their fans can be found at such events. The contact between fan accounts and their followers is slightly different. All fan accounts I spoke to were very open to starting conversations with their followers, and they try to comment, DM, or respond to followers as quick and often as possible. The owners love to chat and get to know their followers. Some fan accounts follow some of their followers, especially the followers who post frequently and are able to share updates about Sebastian. Several fan accounts also talked about how they put interactive things on their Instagram story or have interactive posts, and how they always try to encourage their followers to send requests or suggestions. The last question I asked was a more general one: has anything surprised you about having a fan account? More negatively speaking, you could say that there happens to be some (anonymous) hate every now and then, and there can be some unnecessary drama. ‘It is interesting how you meet new friends and have strong connections with these people without even meeting them in real life’. Globalization is happening online. Social media platforms enable people to connect with fans from all over the world, which can lead to friendships. Liberman, Plugh, and Geltzeiler show us that social media has changed the communication of fandoms online. Because of immediacy, connections are being built in an easier and faster way. Fandoms are more accessible which makes it easier for fans to become part of that fandom. Online, passivity has been replaced by (inter)activity. By sharing a similar interest online, fans are constructing a sense of community and feel a connection with each other. Largent and Burnett teach us that fans have journalistic traits as well: they have an active role online, and constantly give their followers updates about their idol. My own research shows that Instagram fan accounts make many connections online. One of the reasons to start an account is actually to be more active in the fandom, and to meet other fans. Fan accounts have ‘close’ connections with other fans, genuinely care for each other, and feel grateful to have met people online. Besides contact within the fandom about Sebastian Stan, there are many chats and groups about Marvel (actors) as well. Most contact is on a daily basis, if not every few days. On Instagram, DM’s are checked and responded to as often and quickly as possible. Although most group chats are inactive, they do exist and are an easy way for people to connect with each other and share their passion. Most contact is online, but the desire to meet in person is present. Through chatting, fans get to know each other more personally. In sum: connections online are being built and maintained every day, and ‘strangers’ become friends. Burns, Kelli S. (2009). Celeb 2.0: How Social Media Foster Our Fascination with Popular Culture. ABC-CLIO, LLC. BuzzfeedNews, Rachael Krishna. (2017). Why a supporting Marvel character has one of the internet’s most passionate fandoms. Largent, Julia E. and Jason Roy Burnett. (2015). Television, Social Media, and Fan Culture. Lexington Books. Liberman, Corey Jay, Michael Plugh, and Brian Geltzeiler. (2015). Television, Social Media, and Fan Culture. Lexington Books. Lindsey, Fie, Nicole, Rocky, Ruby, Telle. (2018). Wecare4seb. Instagram. Slade, Alison F. et al. (2015). Television, Social Media, and Fan Culture. Lexington Books. Wikipedia. (2018). List of Marvel Cinematic Universe films. Wikipedia. (2018). Marvel Cinematic Universe. Online Culture: art, media and society student.